Obviously, this is a tri, quad, quint, sept, octologue where merits and shortcomings will be discussed, as well as obliquely visualized. Under Eda Holmes direction, Misalliance redefines the delineation of the title by utilizing the individual special talents of her more experienced thespians. Plot-wise, we meet a very successful middle-class underwear manufacturer (i.e. Stanfield or Denver Hayes) whose son is underutilized in the business, and whose sister is dispassionately engaged to the foppish & nerdy son of a Lord – Summerhays KCB. Daddy-o is Thom Marriott and he is a thespian giant in this role. From that mane that Trump would die for, to his comedic pauses that are worthy of a Flip Wilson or Bob Hope, Marriott is a constant scene-owner. His closest competitor is the veteran Festival favorite, Peter Krantz who can express more emotion with just a facial expression than most actors with discourse. His debates with Marriott are as good as theatre gets, and his bits with Krista Colosimo (Hypatia) will keep the audience hanging on every word. Even his elucidating the many tribulations he’s faced fathering son Bentley (the nerd) will touch any parent who has fathered a disappointment. Speaking of disappointment, Colosimo is a distracting flouncer and whose diction is more shout than projection. Marriott’s son is portrayed by Jeff Meadows and this writer still can recall his cabbie/fiancé role in The President (listen…DO). I grew up with a number of Westmount’s scions and could see pastiches of each of them in his depiction. He had my & our empathy from the get-go. The geeky Ben Sanders looks, dresses and acts the part so credibly that I wanted to actually punch him out…just because he deserved it and needed it. 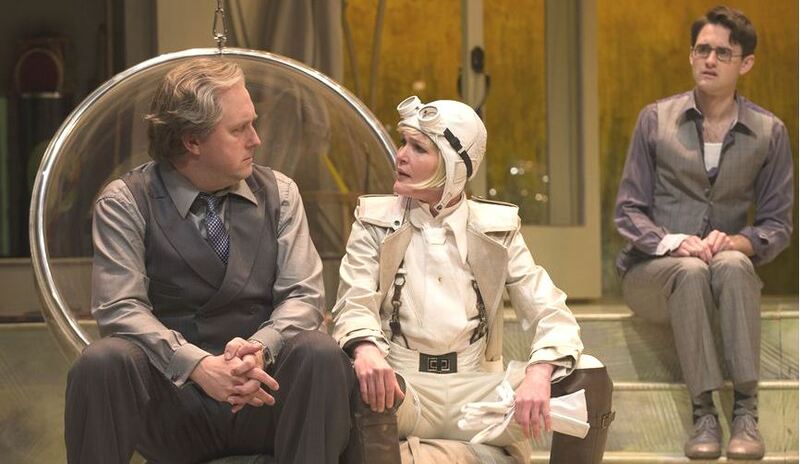 Fortunately, Tara Rosling’s “Lina Szczepanowska” character – a totally liberated Amelia Earhart-ish type not only manhandles him; she also physically & sexually manipulates every other male on stage! Rosling can express sentiment and passion with the most expressive stances this scribe has ever witnessed. You go, girl! The setting is elaborate and appropriate as are the highly detailed costuming. One small query, how does Lina and company expect to take off when the plane has crashed through the Tarleton’s roof??? For all you pedants, ‘decennial’ means once each ten years; and KCB is a Knight Commander of the Bath. In our household – that’s Terry!